Gotcha! Smile! Say Cheese! You’re on Candid Camera! Caught in the act! The NYPL (New York Public Library) has just documented the blank check mentality it expects from a cast of supporters it believes can be trotted out to reliably . .
. . . To reliably what? We’ll get to that in a moment. Just so everybody knows (pardon any repetition): The Central Library Plan (CLP) is the consolidating shrinkage of more than 380,000 square feet of library space down to just 80,000 square feet of space. Two significant pieces of Manhattan library real estate would be sold, going the way of the 53rd Street five-story Donnell Library before them: the Mid-Manhattan and SIBL (Science, Industry and Business Library). As part of the big squeeze, the research stacks of the 42nd Street Central Reference Library would be ripped out, the books banished. Don’t expect the “new” version of the CLP to be anything more than the old version with a new veneer, its real estate sale and shrinkage goals still intact, still preeminent and still driving all the decisions being made. What do you do in the interim if you are the NYPL and you are beset by such difficulties? You dig your grave deeper by putting up a "Voices of Support" page for the nonexistent plan, thus having your “supporters” on record as supporting virtually anything and virtually nothing. The Times article doesn’t mention that furtherance of the half-baked plan may have been impeded somewhat by the two lawsuits that have been brought against the plan, including the one in which Citizens Defending Libraries (I am a cofounder) is a plaintiff. (The article doesn’t mention the lawsuits, but comments can.) The timing of the article was somewhat luscious in that the NYPL’s announcement came just one day after Citizens Defending Libraries delivered its 16,000 plus signature petition (most of those signatures are online) to Mayor Bloomberg at City Hall. Who are some of these supporters the NYPL feels can be depended upon to support, sight unseen, a plan for sale of library real estate, shrinkage of libraries and banishment of books? Urban Librarians Unite, Kathy Wylde of the New York City Partnership and the Building and Constructions Trades Council of New York. 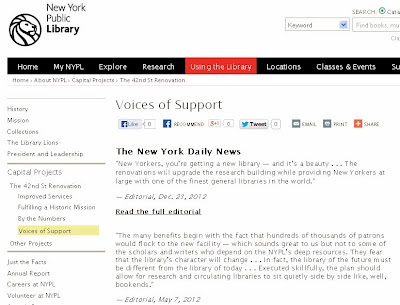 In the case of the NYPL’s Central Library Plan, Ms. Wylde’s blank check support will be the inverse of Atlantic Yards: In the case of Atlantic Yards, supporting the megaproject from the beginning, Ms. Wylde continued her unswerving support as the megaproject degenerated profoundly; in the case of the CLP, she is now documented as supporting from day-one a plan so bad that its authors had to withdraw it out of embarrassment. In either case, the minimum standard for her fixed support as things shift is a discernibly low bar. Unfortunately, what we get from power-elite representatives like Ms. Wylde is the bottom line of wealth speaking to wealth, resulting in what many of us see as rigged deals, where the vagaries of any public benefit are relegated to afterthoughts to be primped up for public consumption afterwards. .
Support from Urban Librarians Unite for a plan about which nothing is known except that libraries will be sold and shrunk and books banished may seem strange, until you closely consider that it is almost seems as if Urban Librarians Unite was created with such support being their primary purpose. See: Saturday, June 8, 2013, Irony Of Ironies: Urban Librarians Unite, Holding A “We Will Not Be Shushed Read In June 8 & 9th! 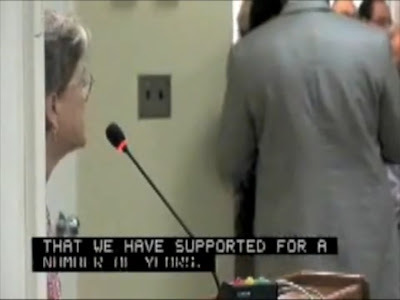 Sign Up Now!” Event, Wanted To “Shush” Citizens Defending Libraries About It. Construction unions are interested in the churn. They are not interested in what is in the public interest (hence their partnering with Ratner). Frank Lloyd Wright once facetiously proposed that all of Manhattan be leveled and replaced by just two phenomenally enormous tall towers. I often think that if such a plan were proposed today the construction unions would be out in droves to support it, not because it was in the public interest but because it would mean a huge amount of union jobs, both demolition and construction. When it comes to libraries, this reflex on the part of construction unions hurts not only the public, but also other union workers as well. As was mentioned at a forum at Barnard College this past week (For the Public Good: Public Accountability in NYC, A panel with Elizabeth Blackmar, Aaron Pallas, and J. Phillip Thompson, Thursday, November 7, 2013) the selling off and privatization of public assets like schools and parks is often intertwined with motivations of disenfranchising union workers. We now expect to unveil the new design sometime after the New Year. In addition, any bedraggled release of plans at the tail end of the Bloomberg administration would just associate a design rehash more firmly with the increasingly unpopular departing Bloomberg administration. 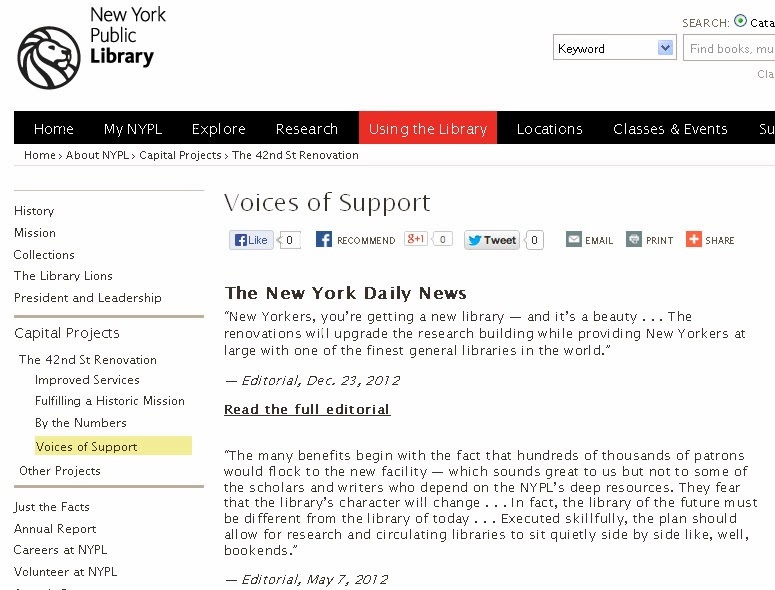 No doubt, what the NYPL will want to do is seek a willing collaborator in the de Blasio administration to make it somehow seem that they have a plan that can be considered as “new” and different and probably that the plan is even, in part, a response to Mr. de Blasio’s own high standards and insistence on improvement. At that point they will trot out again the supporters now on record as supporting the old, discredited plan and hope that nobody will be keeping track. Chiara de Blasio, candidate de Blasio's daughter vouching for her father about the the sell-offs of public assets we won't see if her father is elected. Will de Blasio fall for it, or, acting in collaboration, expect that others will? 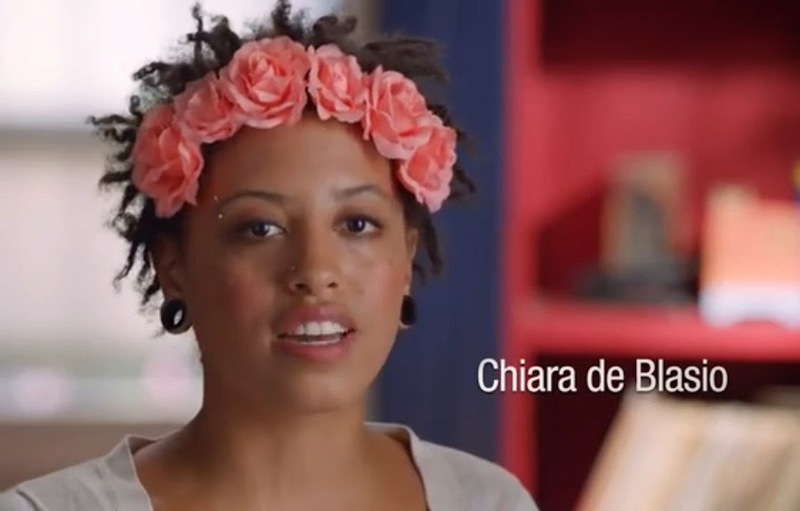 During the campaign his daughter, Chiara, gave us assurance about where her father stood respecting the sale of public assets. In the end, the sale of NYC public libraries will remain at bottom what it is: real estate deals for the benefit of developers, not the public. I don’t think de Blasio will fall for such an NYPL ruse and I certainly hope that when it comes to these matters he will steer his own unveering course. The legitimate amount of money can be taken out to get the best deal done. I honestly want to know what *your* agenda is. It seems totally real estate based and not actually LIBRARY based. Urban Librarians Unite is here to preserve library jobs and keep libraries open AND STAFFED. You have no care for librarians, library workers, or NYC jobs. Without librarians, it's not a library, it's a book depository. ULU has done nothing but support libraries, library workers, and communities who need their libraries. Not to mention their amazing work during Hurricane Sandy. What were you doing during Hurricane Sandy? What have you done to get libraries like Coney Island up and running again? You don't care about libraries, you care about buildings and real estate. In another vein, you are the weirdest and strangest anti-library people I've ever had the displeasure of meeting.